A woman shows a dry radish plant at her drought-affected plot, in the southern village of San Francisco de Coray, in the department of Valle, Honduras, Aug. 13, 2015. Honduras must develop a long term approach to combat the impact of drought exacerbated by climate change and put the poorest and most vulnerable at the center of government initiatives and funding, a U.N. special envoy said. Two consecutive years of severe drought linked to El Nino - a warming of the Pacific Ocean's surface that causes hot and drier conditions - have decimated crops and battered subsistence farmers in the "dry corridor" running through Honduras. One in four in the country of 8 million people are affected by drought and are struggling to feed themselves, according to the United Nations World Food Program (WFP). "The impacts are aggravated and exacerbated by climate change," said Mary Robinson, U.N. special envoy for El Nino and climate change, by telephone from Honduras at the start of a visit to the Central American nation. Honduras is highly vulnerable to extreme weather linked to climate change like hurricanes, floods and drought, while unequal access to land, deforestation and soil degradation has exacerbated the impact of El Nino on rural areas, experts say. The prolonged drought in Honduras has slashed bean and maize harvests by up to 90 percent in some areas, triggering higher food prices. This has worsened hunger among poor farming families who have resorted to cutting meals, and caused many Hondurans to leave home in search of better prospects in the United States. "We need to make it clear that people are bereft of their own resources and we are seeing malnutrition and acute malnutrition among children," Robinson, a former Irish president, told the Thomson Reuters Foundation. "It's absolutely necessary to understand that this is the new normal." Around a quarter of all young children in Honduras aged between six months to two-and-a-half years suffer from chronic malnutrition, WFP figures show. Robinson said the government should not do more to strengthen the ability of subsistence farmers to withstand the longer dry spells, more frequent floods and hotter temperatures linked to climate change. She said this involves "putting people at the center" of government policy to help those in poor rural communities, particularly children, hard-hit by the drought. Women-led initiatives to boost agriculture that focus on managing water better, planting trees and diversifying crops is one way to boost resilience, she said. "There is a need for a genuinely integrated approach that is objective and fair," Robinson said. Trust needs to be forged between communities and the government, Robinson said, noting that little support was given to small-scale farmers, while large amounts of government funds were spent on building dams and large-scale palm oil projects. FILE - Bags of provisions, donated by the United Nations World Food Program (WFP) food reserves, are seen during a distribution of food aid to families affected by the drought in the village of Orocuina, Aug. 28, 2014. 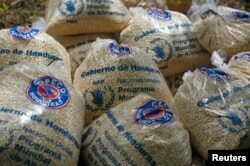 The United Nations says a U.N. appeal for $44 million to provide food aid and water to 250,000 Hondurans in drought-stricken areas is a quarter-funded so far. Drought has also hit hard other parts of Central America, and in Haiti. The U.N. Food and Agriculture Organization estimates that around 3.5 million people are struggling to feed themselves in Guatemala, El Salvador and Honduras, and of that number, 2.8 million are relying on food aid to survive.